With the I.D. Buzz concept, VW Commercial CEO Eckhard Scholz, from left, design chief Klaus Bischoff and brand CEO Herbert Diess celebrate the return of the Microbus. 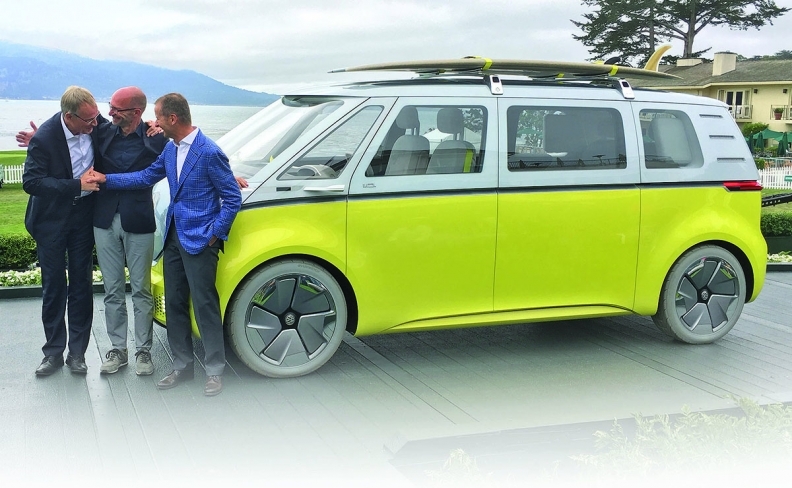 PEBBLE BEACH, California -- Bringing back the iconic 1960s-era Microbus might seem like a warm and fuzzy nostalgia play, but Volkswagen has something more functional and potentially lucrative up its sleeve than happy memories. VW plans to use the modernized vehicle to put its U.S. dealers into the commercial vehicle business -- a segment for which the company has growing global aspirations. The I.D. Buzz, confirmed for production here on Aug. 19, will serve twin purposes, said Volkswagen brand CEO Herbert Diess. It will give VW dealers a high-tech electric van with decades of positive goodwill behind it. And it will come with the design flexibility to let dealers upfit it for small-business owners and contractors who might want something flashier than the run-of-the-mill commercial van currently available. The I.D. Buzz will arrive in 2022 with Level 3 autonomous drive technology, said Eckhard Scholz, CEO of Volkswagen Commercial Vehicles. "There is quite an opportunity for us in commercial in the United States," Scholz told Automotive News. "And this car has the flexibility to serve as both a passenger car and a commercial van." Volkswagen doesn't participate in the U.S. commercial van market, which is a key profit source for Detroit's automakers and a target for other import brands -- notably Nissan. But unlike Nissan, which sells a full-size pickup and cargo vans, Volkswagen has no U.S. products to throw into the fight. Fifty years ago, its underpowered and lightweight bus did not particularly lend itself to rugged American business use. And its design evolution into a squarish and sturdier-looking Vanagon and Eurovan in the 1980s and '90s fell flat before disappearing from the portfolio. VW's early '60s attempt to introduce a U.S. truck so threatened the domestic auto industry that the United States adopted its famous chicken tax in 1963 -- a 25 percent tariff on imported trucks. That tariff still complicates product plans for Volkswagen and all other truck importers. But VW is determined to tackle the commercial segment now, Scholz said. Scholz said it has not been determined where the I.D. Buzz will be manufactured. The automaker's commercial arm will produce the model, as it has produced all previous generations since the 1950s. The commercial unit operates a large manufacturing plant in Hannover, Germany. But Scholz said it is unclear whether that plant will build the U.S. version. VW's assembly plant in Chattanooga is also a possibility, he said. This year, Volkswagen Truck & Bus, headed by former Daimler executive Andreas Renschler, formed an alliance with Navistar International Corp. That arrangement gives VW its first toehold in the U.S. large-truck business. VW's van production in Hannover falls under Renschler's direction. In the 1990s, Renschler led Mercedes-Benz into the U.S. SUV market with its first North American assembly plant in Alabama. VW's diesel emissions violations provoked outrage around the world and prompted a review of the company's strategic goals while derailing an aggressive multiyear U.S. growth plan and toppling executives in Europe and North America. The crisis forced VW to back off a strategy to meet more stringent fuel economy standards with efficient diesel engines and to more fully embrace electric vehicles. The I.D. Buzz is part of a trio of planned models on the company's new MEB platform, which will rely on a flat and thin battery to power vehicles with a range of some 270 miles per charge. The batteries will be positioned under the floorboard to eat up as little cabin space as possible. Klaus Bischoff, head of Volkswagen brand design, said the move to an electric powertrain allows for a more open and flexible interior for either passengers or cargo. But it also allowed designers to give the van something he said has been lacking for decades: "a sympathetic face." "Our vans had to have grilles to permit airflow for their engines," Bischoff told Automotive News during the Pebble Beach unveil. "Cars have been moving to more aggressive grilles. It's not a friendly look." He pointed to the grille-less front end of a 1960s-era VW bus on display at the event. It featured a flat, colorful body panel with a large round VW logo instead of a metal grille. "We want to return to a happy look," he said, "and the EV approach makes that possible." On his visit to Pebble Beach, brand chief Diess wanted to see for himself just what Americans think of his vans. He and an entourage traveled to a nearby windy beach to take photos. As soon as the cheerful neon yellow and gray I.D. Buzz concept vehicle, with a surfboard on its roof, was parked, beachcombers walked over. They asked questions, peered inside and did what many American consumers do at the appearance of a decades-old Microbus — share their personal memories of VW campers in the 1960s and '70s. Diess said it was an eye-opening moment. "It really is part of the California culture," he said. 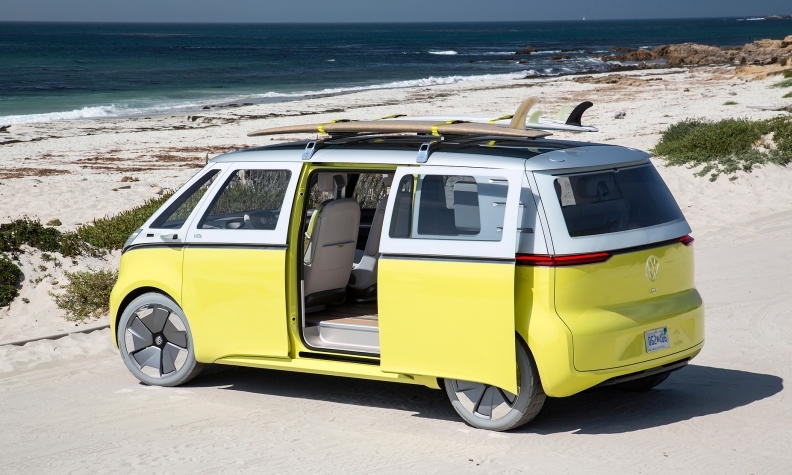 "We've tried six or seven times to bring back the Microbus over the years," he said. "It was never right. When you added an engine to the design, it changed everything. But now, with our new platform, as an EV, we can finally design it like it should be."